Grilled Tandoori Chicken or Indian Tandoori chicken/ Barbeque chicken, is an Indian specialty, widely popular in most south Asian countries and renowned all over the world. 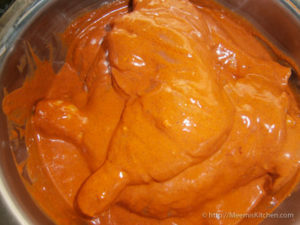 Tandoori chicken, as the name suggests, is chicken roasted in a Tandoor (a cylindrical Clay oven commonly used in India). Chicken pieces are marinated in Yoghurt and spices for ample time in advance and roasted on moderate heat on Tandoor, grilled or barbequed. Since, we don’t have a Tandoor oven, I grilled the Tandoori chicken in my Gas oven and it came out perfect. Grilled Tandoori Chicken is a favorite at home like the Kebab or Roast chicken and the hot, succulent chicken thighs disappear within no time! Since the winter season has started, it is barbeque and grill time and homemade grilled delicacies are devoured with family and friends.Together with some Naan or Pita bread and some Garlic Mayonnaise it is a wholesome meal, and very popular like Biriyani. As we step into New Year, this grilled Tandoori chicken is my special New Year recipe for you. With homemade marinade consisting of simple ingredients, available at home, you will soon become a fan of this wonderful dish. Also check my Chicken Tikka Pizza and Chicken Tikka roll/ Kati roll recipes. Like Chicken 65 and Kebabs, please follow the recipe and tips, step by step, to ensure best results. You can grill on electric grill, gas grill or barbeque grill on moderate heat or even pan roast the Tandoori Chicken on a Grill Pan over low heat. 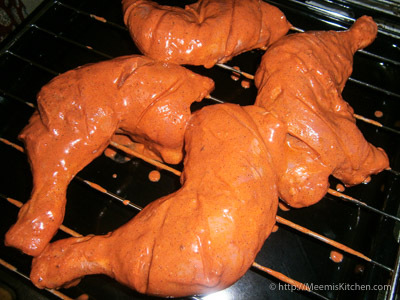 So, get ready to welcome New Year with homemade grilled Tandoori Chicken. Wishing you all a great and fantastic New Year filled with lots of Hope, Laughter and good Cheer! God bless! Black Cardamom (optional) : 1 no. Mace (Jathipathri) : One pinch. Clean and pat dry the chicken thighs. Poke with a fork and make holes. Make deep slits with a knife, one inch apart and keep aside. 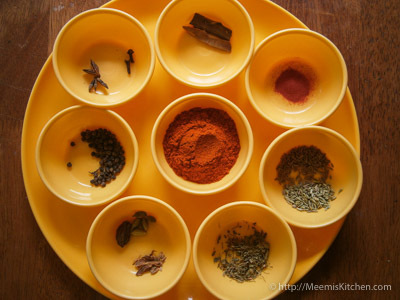 Grind the Chili Powder, Cinnamon, Cloves, Cardamom (peeled), Star Anise, Cumin, Fennel, Pepper, Kasuri Methi and Mace. 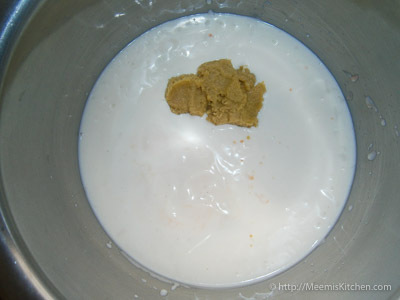 Also, grind unripe Papaya and Ginger Garlic to fine paste. 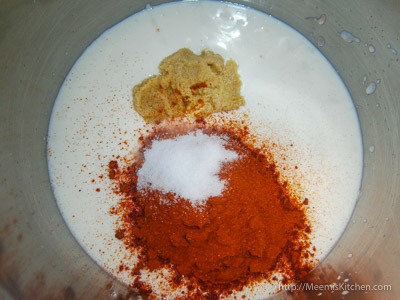 Add this masala and spice mix to curd, and mix well with little food color, lemon juice and salt. Marinate the chicken pieces with this (cover fully) and cover and refrigerate for 8 -12 hours or overnight. Take out the Chicken pieces from the fridge two hours before grilling. Brush the grill rack with oil and arrange the marinated chicken thighs over it. Spray or brush with oil slightly, put on low heat and grill for about 10 minutes, daub with more marinade and grill for another10 minutes. Turn the chicken thighs and grill for another 20 – 25 minutes; cook both sides, spraying/ brushing with oil and marinade in between, till the chicken is perfectly cooked, charred and tender. Serve with Mint Chutney, Lime, Onion and Salad. Enjoy!! I have added red food color to make it more appealing and colorful. However, if your kids are allergic to colors, you may avoid it. 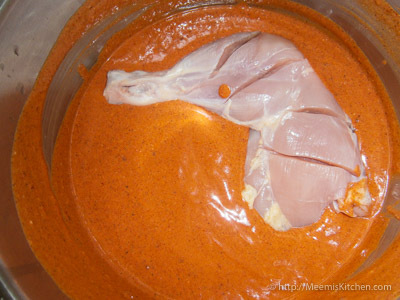 For best results, marinate Chicken pieces overnight or for 10- 12 hours. Tender Chicken is best for Grilled Tandoori Chicken. Spraying/ brushing with oil gives it a glaze and keeps the chicken moist. 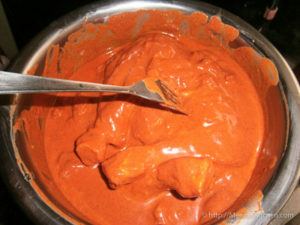 Chicken thighs are best for Tandoori style chicken, however, you may also try with other large chicken parts. Peel the Cardamom before grinding. Always grill on low heat, and cook till you get a nice char on the chicken. You may also bake the chicken in oven. Cover with foil for the first 15 minutes and remove the foil to get the char. Oven grilling takes a little more time than gas grill. 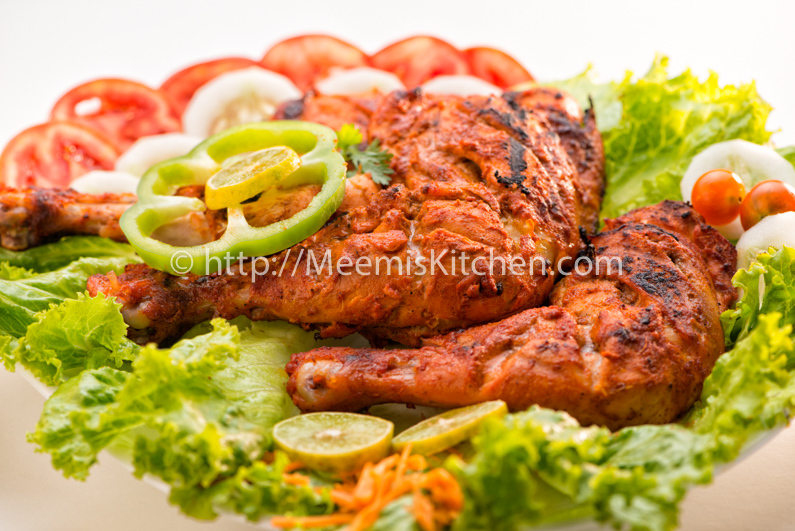 Enjoy this wonderful Grilled Tandoori Chicken and let me know how you like it. Happy New Year and God Bless!! Looks awesome! I got to try this! Thanks! Let me know how it turned out for you.